Our whirlwind tour of London is at an end: right now we’re in Heathrow waiting to catch a plane to Zurich and then another to Athens. In two very short days we’ve managed to catch the British Museum, the Victoria & Albert, the Tate Britain, the Tate Modern, the National Gallery, St Paul’s, Westminister Abbey, and a flurry of shops and restaurants. We’ve taken the Tube everywhere, despite security concerns (we arrived the same day as the thwarted car bombings) and have walked all over the city in the chilly rain. It’s been a great set-up for our long stay in Greece. One of my favorite stops was not originally on our itinerary. The Natural History Museum is right next door to the V&A, so we had to go in. 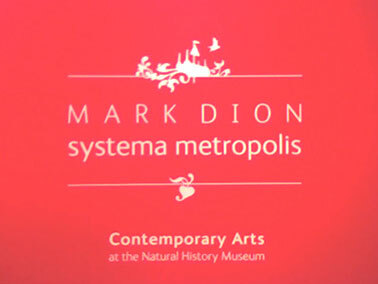 Amazingly enough, they have a Contemporary Arts Program (similar to the one at the LA museum) and were featuring Mark Dion. Now this may come as a surprise, but for most of my childhood, I wanted to be a paleontologist. I had even an extensive bone and rock collection that I meticulously catalogued. This might explain my perpetual fondness for any artwork that features nerdy research projects. 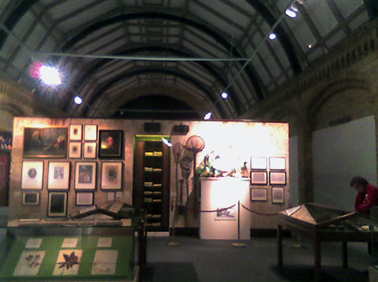 Anyway, Mark Dion has worked with the museum to create four “fieldwork” projects and has created gorgeous installations that feature all the research in hermetically sealed environments that catalogue, explain, dialogue and wittily display the work of these whimsical projects which attempt to take on the urban landscape and biosystems. To wit, in project #1, Dion has gone to a famous English graveyard and taken soil samples of the most prominent denizens in an attempt to determine which particular species of worms inhabit, for example, Karl Marx’s grave. In other projects, he’s driven a car with sticky paper on the windshield around St Paul’s Cathedral to catch bugs, dug up the dead soil of the Olympic park construction site and trolled the River Thames and made neat stacks of the classified flotsam and jetsam — kickballs, bricks, soda bottles, snakes preserved in alcohol. It’s a wonderful, whimsical exhibition that brings to mind one of my favorite art experiences, the Museum of Jurassic Technology. 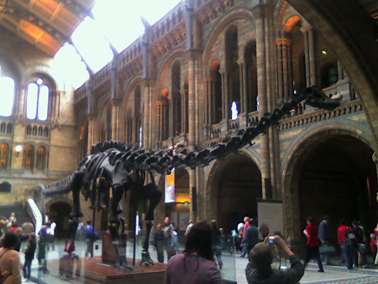 As for the museum itself, well, the dinos weren’t too shabby either. 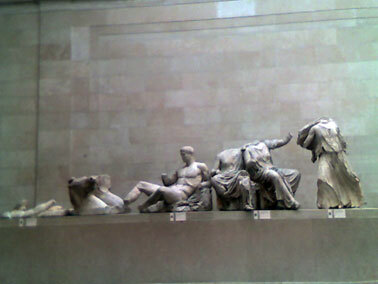 In preparation for our work in Athens, we’re visiting London for two days to see the Parthenon friezes at the British Museum. 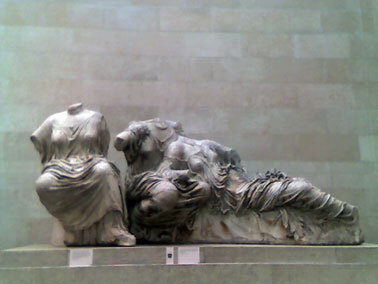 Many people don’t know the controversy of how the museum “acquired” the “Lord Elgin Marbles“.